Skil Power tools, often known as Skilsaw or just the Skil brand, have become quite well known in the industry. 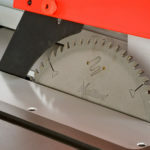 In the same way that Rollerblades (the brand name) get used in sentences in place of in-line skates, the term SkilSaw is often used as the name of the general product category of table saws, reciprocating saws and other handheld ripping machines. The fact that the original founders of Skil Corporation (named Mitchell Electric at its inception in 1924) invented the portable circular saw may have much to do with why the brand names is used as such a general term. A similar situation to this is being formed by SawStop who, having invented new technology in the field went on to found a company based on that technology rather than outsource it to others. Like Ridgid table saws and many of the other players, Skil power tools have been around for a long time. Just in 2012 they celebrated the Skilsaw 75th anniversary. Over their many years, they have built numerous high-end table saws including several of the ones currently available on the market. Also in those years, Skil has entered the low-end table saw market. Even with the entry level Skil table saws, the company has kept its standards high enough to be seen separate from the many cheap knock of brands of saws. Skil has changed ownership a few times over the years. Skil Corporation was first sold to Emerson Electric in 1979 and then again in 1996 to Bosch who currently owns it. While the brand Skil retains its distinct features and marketing, many of the manufacturing and packaging resources are pooled together with its parent company Bosch. Often times when companies buy a rival business they try to keep the two brands as separate as possible in the minds of their customers. This helps them to keep issues with one brand from spilling over to another. Perhaps Bosch feels that both brands will be kept to a high enough standard that they don’t share this concern, but whatever the reason Bosch doesn’t hide its ownership of Skil in any way. They share packing materials as well as a centralized service and parts center. As with any table saw brand, or even such large machines as automobiles, the manufacturer occasionally makes a mistake in the design which requires a recall. I am impressed with the excellent job that Skil Power Tools does in getting this information out to the consumer. In addition to notifying all effected registered users, Skil announces recall information in a prominent position of their main Skiltools website. Because of the possible safety concerns associated with Skil table saws and other power tools, it is always best to register your Skilsaw as soon as you purchase it. However, for those who forgot or otherwise neglected to register, it is nice to see Skil go above and beyond for the safety of their consumers. In terms of warrantee information there is nothing remarkable about what Skilsaw table saws have to offer. They do of course come with a standard limited warranty, which makes sure everything arrives without manufacturing defects or other issues caused not by the consumer. In the case of such defects they can either replace the Skil table saw or will fix it. Luckily claims are very simple to make and even more so seldom necessary. Of course, if the machine breaks because of consumer abuse, then the user has no recourse here. Again, these is not remarkable, but it does cover the basics required to ensure that your machine is working properly out of the gate. Furthermore, Bosch and Skil table saws are manufactured at a standard that helps consumers feel confident in the quality of their machine. This means less headaches for the consumer and the corporation.